THE FOLLOWING VIDEO IS FOR OUR MACHINE REPAIR PROCESS, NO HEAT GUN OR SOLDERING IRON WILL BE USED IN THE REPAIR POCCESS AND THE MOTHERBOARD WILL NOT BE TOUCHED BY A SOLDERING IRON IN ANY WAY.USING OUR REPAIR PROCESS WE CAN REPLACE THE HDMI CONNECTOR SAFELY UNLIMITED NUMBER OF TIMES IF YOU DAMAGE IT AGAIN AND AGAIN LIKE MANY PEOPLE DO. THIS IS A SPECIALITY ONE OF A KIND REPAIR AND IS NOT AVAILABLE AT LOCAL REPAIR SHOPS OR ANY ONLINE PLACE, ALL REPAIR SHOPS ONLY USE THE SAME YOUTUVE VIDEO THAT PEOPLE USE AS A DO IT YOURSELF AND THE SAME HEAT GUN AND SOLDERING IRON, THEY CHARGE TOO MUCH BECAUSE THEY CAN SPEND A WHOLE DAY TRYING TO FIX A CONSOLE WITH A DAMAGED HDMI CONNECTOR AND TELL YOU THEY HAVE 50% CHANCE OF FIXING IT!! 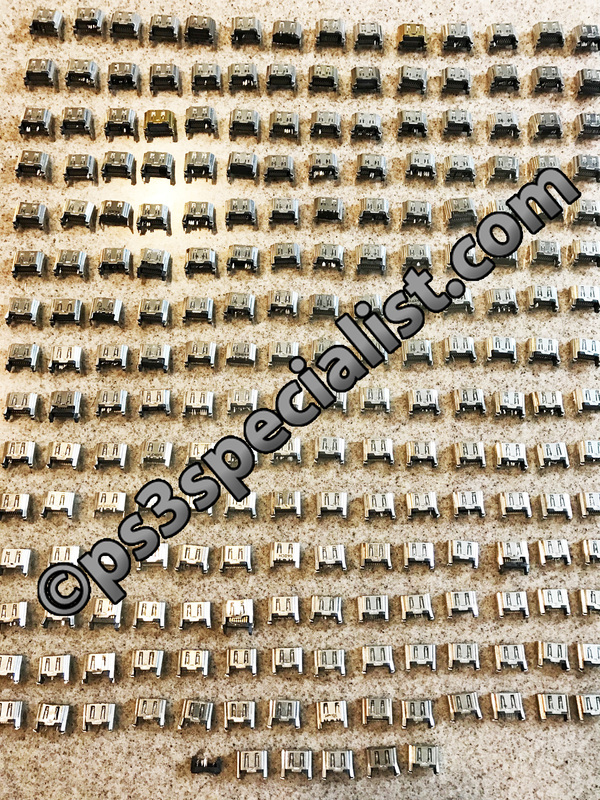 We have successfully replaced hundreds if not thousands of HDMI connector on PS4 , the pictures speak for themselves. The turn around time for this service is 3-5 days but you can choose the one day option if you want to have it done within 24 hours from receiving the console. You are welcome to read our customers reviews to see how was their experience with our HDMI port replacement . WE ARE ACCEPTING NEW BUSINESS ACCOUNTS TO GIVE THESE REPAIR SHOPS A CHANCE TO MAKE MONEY FROM OUR SERVICES WITHOUT CAUSING DAMAGES TO THEIR CLIENTS CONSOLES SO WE DON'T WANT TO GET THEM OUT OF BUSINESS LIKE SOME OF THEM THINK, WE JUST WANT TO SAVE THESE CONSOLES FROM GETTING DAMAGED IN THE WRONG HANDS AND WRONG TOOLS AND TECHNIQUES. 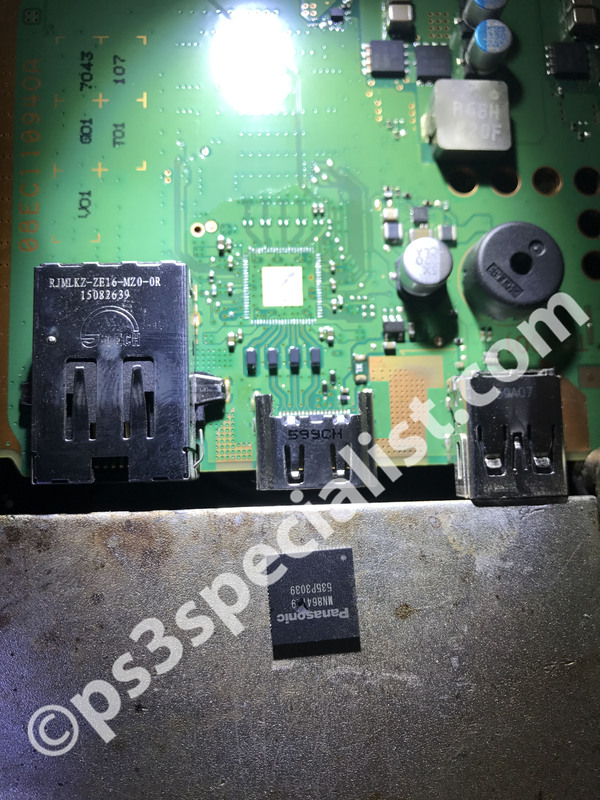 AND HERE IT IS AFTER OUR REPAIR , THE OWNER OF THAT CONSOLE WAS LUCKY WE WERE ABLE TO SAVE IT FOR HIM BECAUSE THERE WAS NO DAMAGED TRACES WHICH IS USUALLY THE CASE WHEN MICRO SOLDERING IS DONE USING A SOLDERING IRON AND A HEAT GUN. 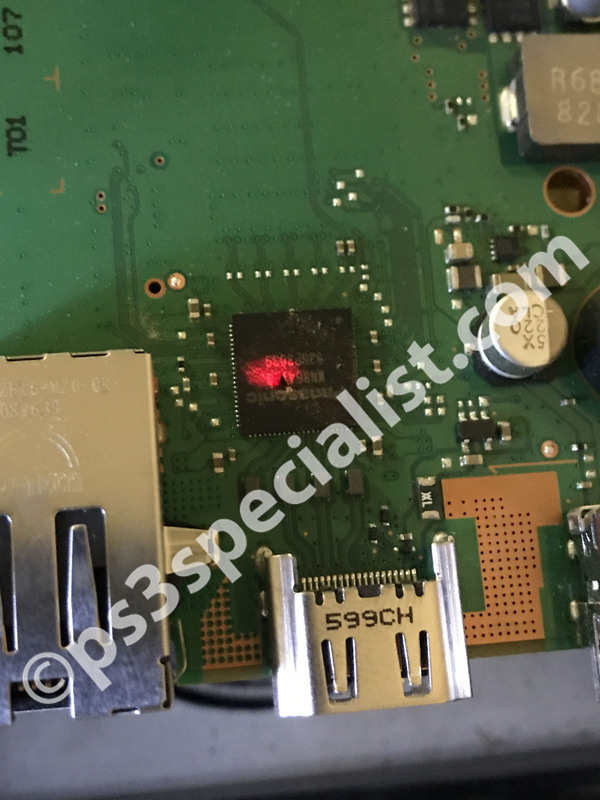 BEFORE YOU SEND YOUR CONSOLE IN FOR THIS REPAIR PLEASE MAKE SURE IT CAN TURN ON AND GOES TO THE WHITE LIGHT, IF IT STAYS AT THE PULSING BLUE LIGHT THEN IT HAS THE BLUE LIGHT OF DEATH EVEN IF THE HDMI CONNECTOR IS DAMAGED AND NEEDS TO BE REPLACED YOU WILL ALSO NEED THE APU CHIP REBALLING AS WELL WHICH WILL COST EXTRA. One more reason to make you send your console to us and not anybody else, we fix every problem with PS3 and PS4 not just the HDMI connector so if there is any other problems with your console we won't tell you we don't fix the problem your console has and you end up loosing the shipping costs and your console still has not been repaired like everybody else would do. 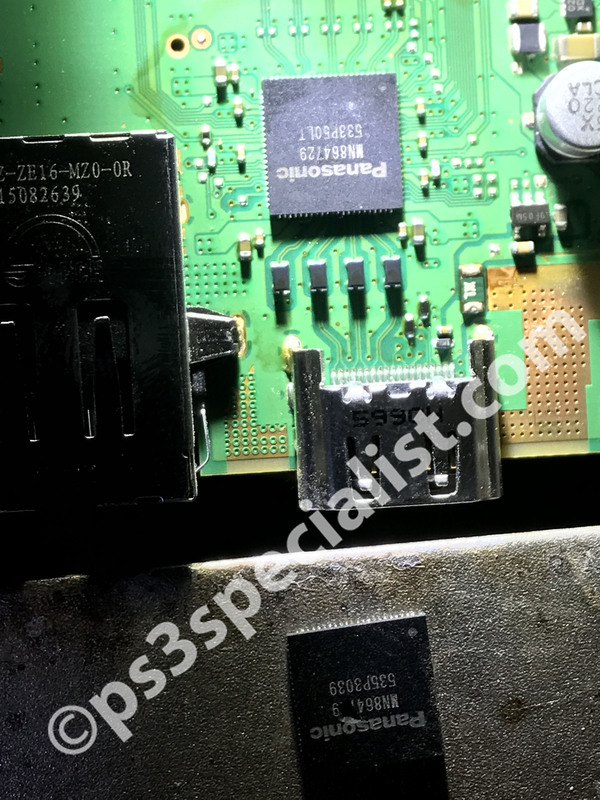 Very often the HDMI port when it gets damaged it gets pushed inside far enough to damage many other very fine components and these components are controlling the video signal output through the HDMI port , most repair shops won't be able to replace these damaged or missing components , we do and usually at no extra cost. 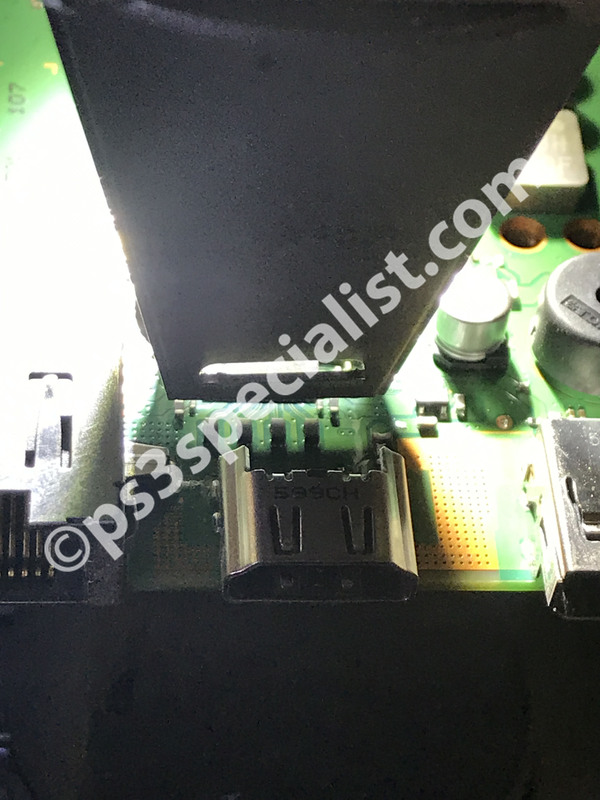 The HDMI connector in PS4 is a surface mount connector , that means its possible for a severely damaged connector to also damage some of the traces it was soldered to, most repair shops won't be able to fix these damaged traces, we usually do unless the damage is severe. We have received PS4 consoles that did not produce video and the HDMI port wasn't damaged in anyway and the console turns on and goes to the white light, these consoles have bad HDMI controller IC chips , replacing these IC chips requires much higher skills and advanced soldering machines , local repair shops and most of the online repair shops won't be able to fix these consoles, we do and the next group of pictures show an example of a damaged HDMI controller IC and why it can only be replaced using machine soldering, hand soldering can not replace it .. period. 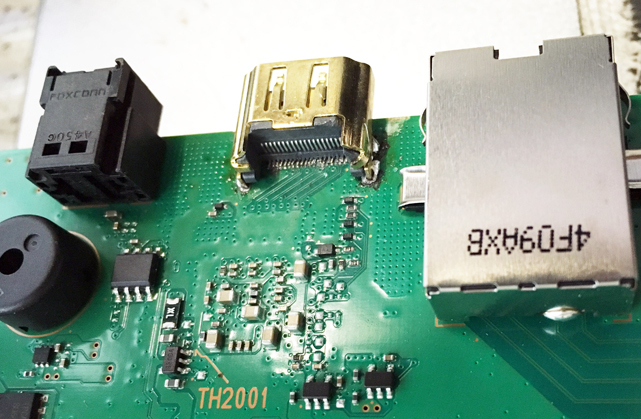 For HDMI controller IC replacement please use our PS4 reballing service. THREE ADVANTAGES YOU WILL GET WHEN YOU ORDER THIS SERVICE FROM US, HIGHEST QUALITY , LOWEST PRICE AND FASTEST RETURN TIME ALL WITH A 100% SUCCESS GRANTEE OR A FREE MOTHERBOARD TRANSPLANT AND ALL THAT IN EXCHANGE OF ONE CONDITION, NO REPAIR ATTEMPTS BEFORE , SO IF YOUR PS4 CONSOLE HAS A PHYSICALLY DAMAGED HDMI PORT AND NO BODY TRIED TO REPLACE IT BEFORE THEN YOU ARE COVERED BY ALL THREE ADVANTAGES THAT NO OTHER PLACE ON EARTH CAN GIVE YOU. We test every console after repair to make sure its in perfect working order when it is shipped back and if there is any other issues we will do the best we can to fix it for you after your approval. 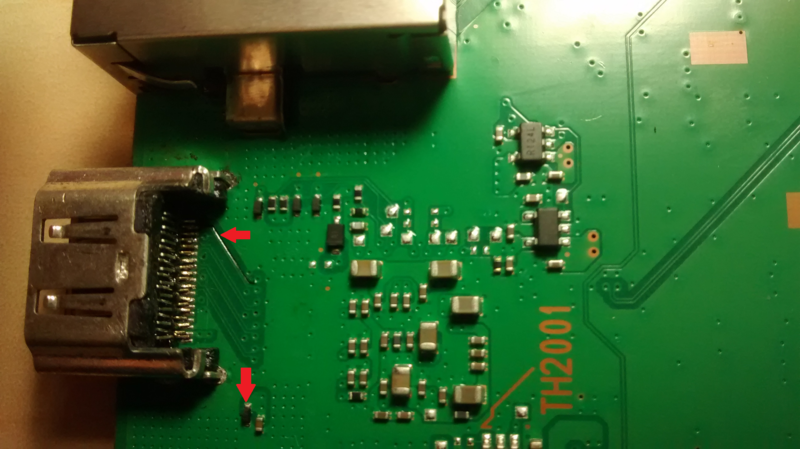 Computerized machine soldering simply means a 100% perfect and successful repair every time and zero% chance of damage to the board or its components. We use brand new HDMI port connector of superior quality compared to the original port connector that gets damaged easily. We only Do this repair by using a computerized machines , special set up for this particular process and our success is 100% , no hand soldering at all and we only use leadfree solder, its 100% manufacturer quality soldering and will look exactly the same way it was done at the manufacturing facilities and no body will be able to realize that the original HDMI port has ever been replaced , more important we can replace the damaged port on the same console not only once or twice but ten times or even more if the new port ever gets damaged and needs to be replaced again and again with the same quality and with no damage to the traces ever. 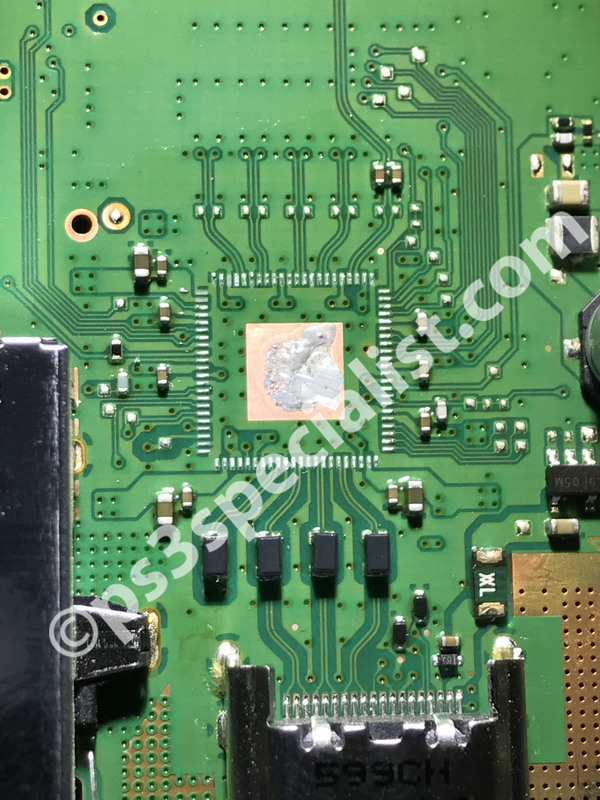 We designed this process to be very fast and accurate professional process and there is no chance for any mistakes or damage to the motherboard traces or any other onboard components, We solder the whole connector in one time not like any where else that uses hand soldering, they solder one trace at the time and that is why our repair is different, our repair is more accurate and has no chance for failure or damage, its not a try and error like hand soldering. Rush service fees if chosen is meant to give your Device a priority over others to be worked on but because in repair business there is no grantee for the repair result this fees is not refundable if the device is not repairable regardless of the reason. You can send only the motherboard or the whole console but we prefer sending the whole console for the safety of the motherboard connectors during the disassembly and reassembly process. Please use the shipping instructions here https://ps3specialist.com/shipping-returns/ to get the address and send your console in once you place your order and you are not required to send any wires or accessories with your console. 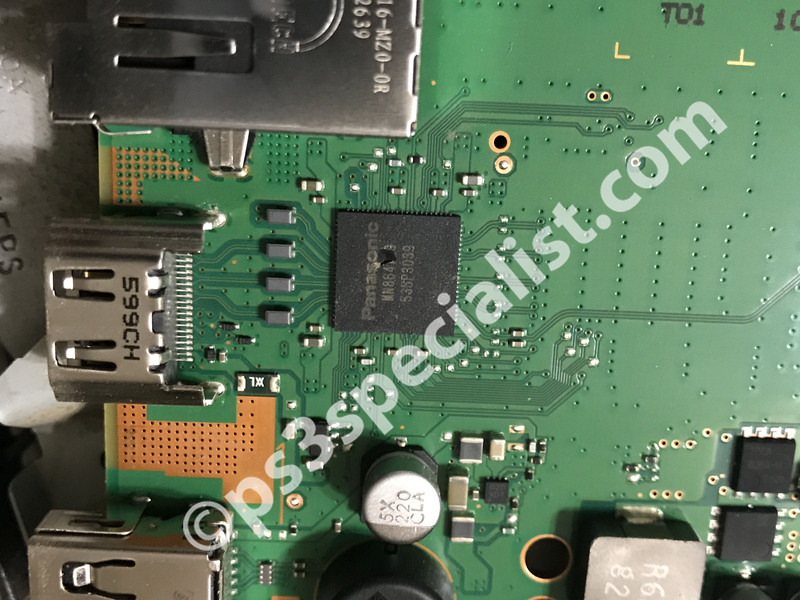 **We see wonders when it comes to soldering the HDMI port on PS4 so we created this specific listing to save your console from going into the horrible experience of hand soldering a damaged PS4 HDMI port connector, the next picture is an example of a failed hand soldering that ended up damaging the motherboard traces, also done by a repair shop!! IF YOUR CONSOLE IS PULSING BLUE LIGHT AND DOESN'T GO TO THE WHITE LIGHT AND DOESN'T SHOW VIDEO THAT IS NOT A HDMI PROBLEM, ITS A MOTHERBOARD PROBLEM , YOU WILL NEED THE APU CHIP REBALLING TO FIX THAT ISSUE, REPLACING THE HDMI CONNECTOR WILL NOT FIX THIS ISSUE UNLESS YOU HAVE BOTH PROBLEMS, A PHYSICALLY DAMAGED HDMI PORT CONNECTOR AND A BLUE LIGHT OF DEATH PROBLEM SO YOU WILL NEED BOTH SERVICES. I want to say thank you very much for the repair of my PS4.. It’s working great. It took a few weeks to get it back but it was worth the wait.. Thank you so much. Great job and fast, highly recommend this guy! Nice Work! Fast Return Shipping, Professional Service and Reasonably Priced. I sent my baby out on a Tuesday, and was returned to me by Friday. She works better than new for me and I can't believe it. I'm very happy with your service and, if I have anymore problems, will definitely go to your site first. This is a great place to do business with! Fast quality repair and fast shipping. Would recommend this service to anyone needing the HDMI repair! Great job guys! Great service! Quality repair! Awesome job! I shipped from GA to CA during the Christmas holiday. My child was able to enjoy his Xmas games. Even with express service & shipping, cheaper than buying a system. Plays like brand new. I was very pleased when i saw my PS4 render in 1080P again! Very quick and reliable, communication is very open and the price was fair. Fantastic service, ultra quick turnaround. Makes a lot more sense then buying a new PS4. Best service with an unbeatable price! I couldn't find any place cheaper and the technology Reballing uses is an added bonus! My HDMI replacement was very quick and Khaled was great with communication! FedEx was problematic in shipping my PS4 back to me and this company fixed it as soon as possible and I couldn't be happier to have my console back and working perfectly! I highly recommend reballing genius for ps4 port replacement. super fast service. I shipped my ps4 out on a Thursday and received my console back the following Monday. Fast turn around and returned in working order. I recommend you go nowhere else for this service. Unbeatable price and service! Thanks again. Best service online by far!!! DO YOURSELF A FAVOR AND DONT GO ANYWHERE ELSE BUT HERE!! 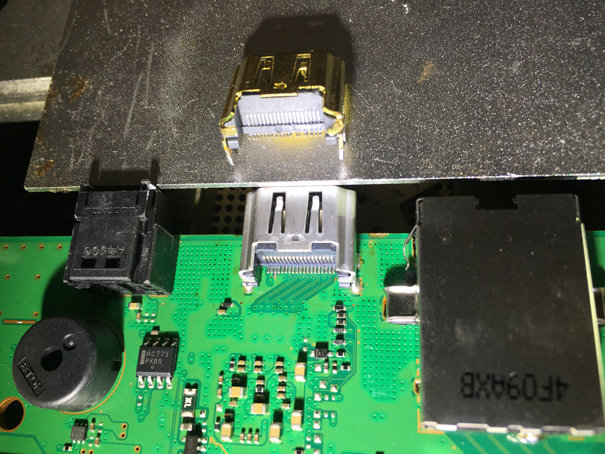 Needed the HDMI port replacement on my PS4 for it had gone bad and couldn't even place HDMI into plug in. Accidentally ordered reballing service in which I didn't need, coordinated with Khaled to refund me the extra funds to receive correct service. Ordered the rush 1 day service and I can honesty say the service exceeded my expectations! Great work! Great service! Great company! Keep up the great work! Thanks Again! Suffered from the faulty HDMI port which drove me to almost go and buy a replacement unit. Discovered this site, turned out my repair was much more than just the HDMI port. I really must commend the prompt communication and overall quick turn around. Now my unit run properly again and I need not buy a replacement. Definitely would recommend using this service. Khaled's services are very unique: he offers top quality repairs for a minimal fee. Some shops charge hundreds of dollars to replace ports and reball boards. Khaled does this for a fraction of the cost in a fraction of the time. 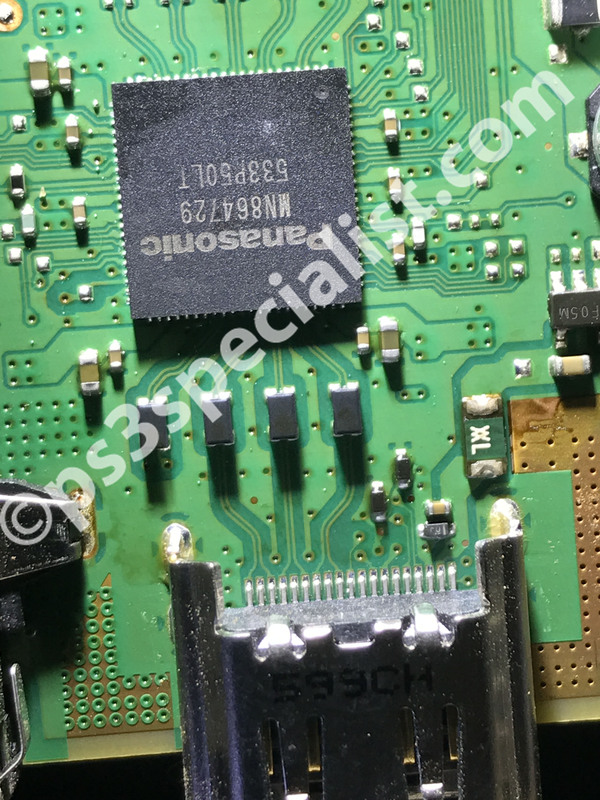 That is why I use PS3Specialist exclusively for board-level repairs. This is the #1 Repair Site, we extremely confident in the work that is done by this company. Highly Recommend and very fast turn around time! Thanks having this great service! I had to have a HDMI port repair along with some broken trace repairs. This was my last attempt at getting my PS4 repaired before tossing it in the trash.. Khaled did an amazing job! Service was quick and efficient! I was given updates throughout the service and the price was unbeatable! I live in the east coast and the turn around time was amazing! I will never use another service ever again! Highly recommend! Everything worked out well & the service was awesome! Still the best alternative to sending console to Sony. Professional repairs at a reasonable price. I have had several fixed here and will not hesitate to send my next one to PS3 specialist for repair. This is an excellent and affordable alternative to DIY repairs which can damage the console. The use of a machine process means you get high quality repairs every time. Highly recommend. this company fixed my son's PS4 and shipped it back to the East cost in six days. Wellworth the money.